Posted October 24, 2018 by Georgia Fullerton & filed under Bondi View, Featured Bondi View. One of Sydney’s most significant and historical sites has re-opened after a 12-month construction program. The Waverley Cemetery Coastal Walk was forced to close in June 2016 due to damage caused by a huge storm battering Sydney’s coast. The walk, and parts of the cemetery, have since undergone restoration works said to have cost over $4.26 million ensuring the site can endure future weather events. Waverley Council helped the public celebrate the cemetery’s re-opening by hosting a community walk last Saturday. Mayor of Waverley, John Wakefield, said, “Waverley Cemetery is iconic within the community due to its position along the Bronte cliffs and unique Victorian charm”. The cemetery’s eastern boundary receives significant traffic from walkers and joggers taking in the Bondi to Coogee coast walk. Cr Wakefield said the feedback from the community has been overwhelmingly positive since the re-opening, “Coast walkers by this time were happily using the diverted path through the cemetery but it was clear that many missed the more exciting views along the original walk cliff-side. Waverley Cemetery is listed on the NSW State Heritage Register and is also noted as a site of significance by the National Trust. 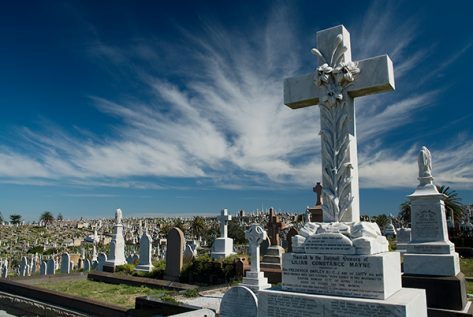 The Heritage Council for NSW awarded the listing based on the cemetery’s spectacular ‘genealogical, historical, architectural and artistic character’. The cemetery opened in 1877, and is the final resting place of some of Australia’s most famous and notable historical figures including Henry Lawson, Dorothea Mackellar and Jules Francoise Archibald. Its famous inhabitants are a drawcard for tourists, who take advantage of the opportunity to soak up a part of Australia’s European history while taking in the spectacular ocean views. The site is also popular with Australian film makers of every genre. The cemetery land was first purchased in 1875, with the intention to build a world class necropolis to rival the finest cemeteries in Europe and the United States. The original design was based on the architectural fashions in London, Paris and the USA at the time, but with the cemetery’s unique position needed to include drainage, roads and fencing. Spanning 16 hectares, since it hosted its first burial only four days after opening on 1st August 1877, the cemetery has seen more than 83,000 interments in about 50,000 gravesites and memorials. The recent repair and maintenance process included roadworks on the entrance driveway, repairs to internal stairways and replacement of cemetery fences. The cemetery gateway was also renovated. Many of the restorations had been well overdue before the storm forced the walk’s closure, with joggers tripping over loose paving stones, and sections of the pathway closed using only caution tape. Cr Wakefield said, “A new lookout was incorporated as part of the restoration works and serves as a resting point along the walkway. “It was designed by the landscape architects who first designed the coast walk in 2006…it also provides a point of contemplation where visitors can absorb the unique surrounds of Waverley Cemetery. He said, “The extent of damage occurred along the coast walk (outside cemetery boundaries) where an embankment was eroded by waves. Audrey McCallum of the Waverley Historical Society, said she believed it is incredibly important to preserve sites of historical significance, ““I think we are losing so much of our heritage in Australia and we need to preserve as much of it as we can. “You go to other countries, especially Europe and see that they have maintained their buildings so well, despite the fact that it may be expensive…we need to do the same thing here, rather than taking the approach that if it collapses we can just knock it down and forget about it. Ms McCallum said it was imperative for governments to make it a priority to maintain sites like Waverley Cemetery or else there would be nothing to show future generations. Ms McCallum said the cemetery is an important feature of the Waverley community, “The position alone as well as the fact that it is one of the earliest cemeteries in the suburbs, we need to make sure that it continues and is further developed in terms of people getting around and appreciating the people and the stories of the people who are buried there. “Many of these are people of historical significance in the local area and those stories need to be told, and their resting place needs to be preserved.